This matte painting is a collaboration with ErikShoemaker for Slashthree’s 20th exhibition, « War ». 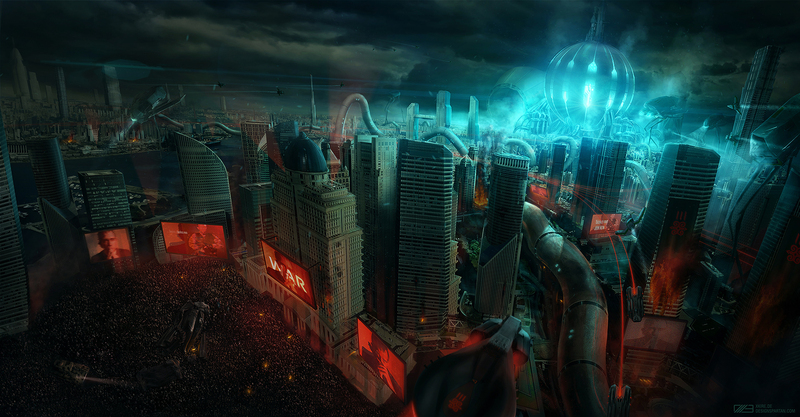 The scene depicts a classic dystopia: riots in a city of a totalitarian regime, a concept inspired by various media. You can see the rest of the exhibition on Slashthree’s website. It is with great pleasure we present our twentieth release, WAR. A tour de force, and a milestone exhibition (our 20th), WAR features more than 60 beautifully crafted works in a variety of medium and artist interpretations. From the word in its most literal form, to abstractions reflecting upon internal struggle, the concept of war evokes a deep emotional response within all of us. We think you’ll agree; WAR is one of the collective’s strongest exhibitions to date.